Preparation of the annual budget of the Syndicate of co-ownership according to the objectives of the Board of Directors. Notice of assessment of the condo fees to all co-owners. Preparation of the cheques for the payments of suppliers and sending them to the Board of Directors for the countersignature. Communication of information related to the employees of the Syndicate to a company specialized in treatment of their pay. Preparation of the annual financial statements of the Syndicate. Complete the income tax returns of the Syndicate. Deposit all the sums received for the Syndicate in a distinct bank account, under the Syndicate's name, in a recognized financial institution. Carry out the necessary reminders to receive the arrears of expenses of condo fees from the co-owners. Transmission of information necessary to a notary at the moment of the sale of a privative unit. Preparation, convocation and participation to Board meetings (according to the agreed number in the contract) and drafting of the minutes. Preparation, convocation and participation to the Annual Meeting of co-owners and drafting of the minutes. Present the budget at the Annual General Meeting of co-owners. Keeping the records required by law. Propose amendments to the regulations of the building. Enforce the regulations of the building. Receive the co-owner's requests and prioritize them with the Board of Directors. Complete the annual declaration identifying the administrators of the Syndicate to the "Registraire des entreprises du Québec". Renew the insurance contract of the building for a new-value determined by the Board of Directors. Preparation, convocation and participation to any Special Meeting of the Syndicate or Board meeting. Negotiate and sign, on behalf of the Syndicate, contracts for the usual supplies, monthly or periodically regular charges concerning the common portions (such as fuel, gas, water, electricity, elevators, insurance premiums, parks, snow clearance, etc.). Negotiate and sign, on behalf of the Syndicate, standard contracts of cleaning and maintenance carried out within the framework of normal management (e.g., simple repairs, electricity, plumbing, locks, etc.). Hire and coordinate the work of the professionals necessary to ensure the maintenance of the building (e.g., evaluation for insurance purposes, periodic inspections, etc.). To make sure that the work done by a supplier is to the satisfaction of the Board of Directors. Managing the staff employed by the Syndicate (including subcontractors). Manage complaints and resolve issues with the relevant persons. Ensure an emergency telephone service 24h/day, 7 days/week. Periodic inspection of the building in order to ensure the cleanliness of the places and identify work to be made. Emergency displacement during evenings and weekends. Management of disasters involving more than one unit or comprising major work or work relating to special techniques. Coordination of major works (e.g., sealing of the envelope of the building, masonry, concrete structures, window replacements, roof, ventilation and heating, etc.) and work relating to special techniques (report/ratio, expertise, etc.). Preparation for the Syndicate on litigation files or recollection of the charges to be transmitted to the lawyers or the bailiffs (i.e., for a legal mortgage). This management option allows you to reduce the expenses associated with management of your co-ownership. Your Board of Directors keeps internal tasks associated with certain elements of the management (e.g. : the operational and/or administrative elements), and you delegate certain tasks to our professional managers who will be pleased to help you. This type of management is usually desired by buildings of fewer than 40 units, and the price depends on the size of the building. However, larger buildings can also use this package to reduce the management fees if the Board of Directors wishes to get involved in the operations of the building. Do not hesitate to contact us at 514 935-6999 to get more details on pricing for financial management, and financial and administrative management. In these à la carte management options, it is also possible for you to have recourse to the services of our managers at hourly rates. At that time, we send you a detailed bill for the work completed. Thanks to our exclusive management software, all the co-owners are informed about what happens in the building. Co-owners have 24/7 access to their account statement, can consult their messages, open service requests and much more. The software also includes tools aimed at facilitating the exchanges and collaboration between the manager and the Board of Directors. Moreover, the management software is integrated with web tools which largely simplify many processes of our management firm, enabling us to grant more time than other firms on added value tasks. All in all, our software tools enable us to offer you more for your money. Our service proposal is definitely the most advantageous in the industry when the quality-price ratio is considered – meaning Value. 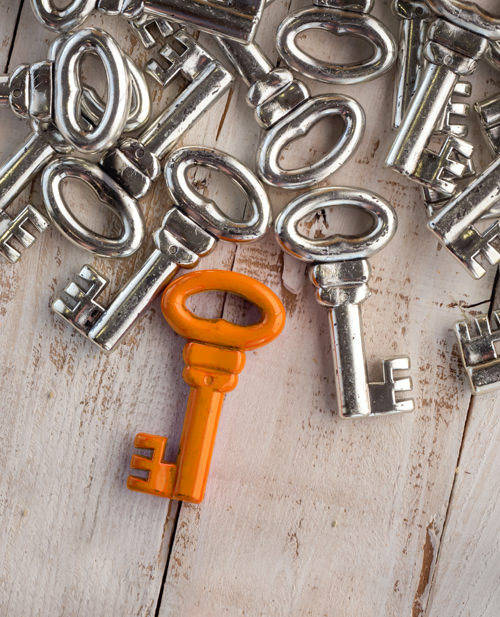 Our qualified managers are surrounded by a well trained team and use exclusive tools, which enables them to be effective in the management of your building and work on your added value tasks. At SolutionCondo, we are confident that by our expertise, we are able to save you a lot of money in your operational budget, by managing your building intelligently and by proposing you innovative solutions. Our concern is that all things go well. The size of our management firm enables us at all times to have qualified people to help you. SolutionCondo is a large team of professionals that works for you and who will always be there, no matter the extent of the emergency and the number of required resources. With us, your manager is not alone. Moreover, the web software enables us to propose several management options and to offer flexibility to go from one option to another easily, while preserving your data. Our team counts more than one forty employees, of which there are more than a dozen managers, several belonging to professional orders (e.g., CPA, Adm.A, etc.). 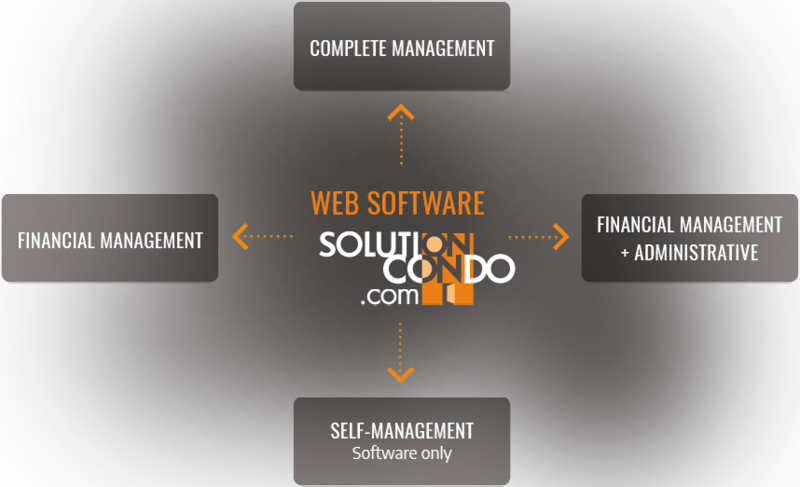 Customer service, accounting, administrative support and technical departments controlled by a building specialist are also SolutionCondo's resources. This team of professionals is bound by common values of excellence, integrity and team work. It is this well-rounded team that makes SolutionCondo's reputation. 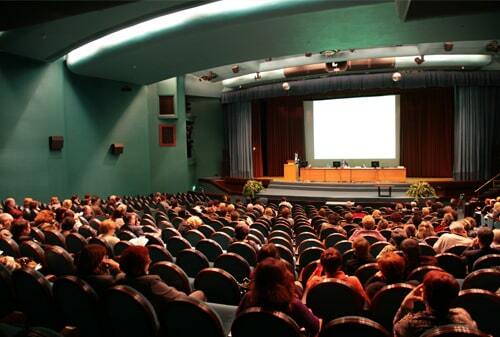 Some annual meetings of co-owners or special meetings can be turbulent because of the topics that will be discussed. Our managers know very well the regulations surrounding the management of a co-ownership and are very good speakers that will allow your co-owners to better understand the reasons behind certain decisions from the Board of Directors. Moreover, being experienced at holding meetings, our managers also have skills that allow them to maintain respect and calm in the audience. Other assemblies are more complex because its administrative requirements, which must be implemented to ensure that a vote is legally valid. We know very well the regulations surrounding the holding of meetings and we will be able to organize and ensure the administration of holding the meeting so that you can have peace of mind following the decisions of the assembly. The administrators of a Syndicate do not always have the necessary availability to deal with the management of major disasters since they require a lot of time and coordination throughout the process between all the involved parties. Indeed, the insurer's customer being the Syndicate of co-ownership, they will want to discuss with a representative of the Syndicate (usually one of the administrators) so that they act as an intermediary between the co-owners involved in the incident and the company which will undertake to repair the damage. In addition, the Board of Directors must be able to make sure that repairs were carried out properly before the insurer closes the file relative to the damage. Hence, we are able to act as the Syndicate's representative to fulfil this role of coordinator for your Board of Directors.